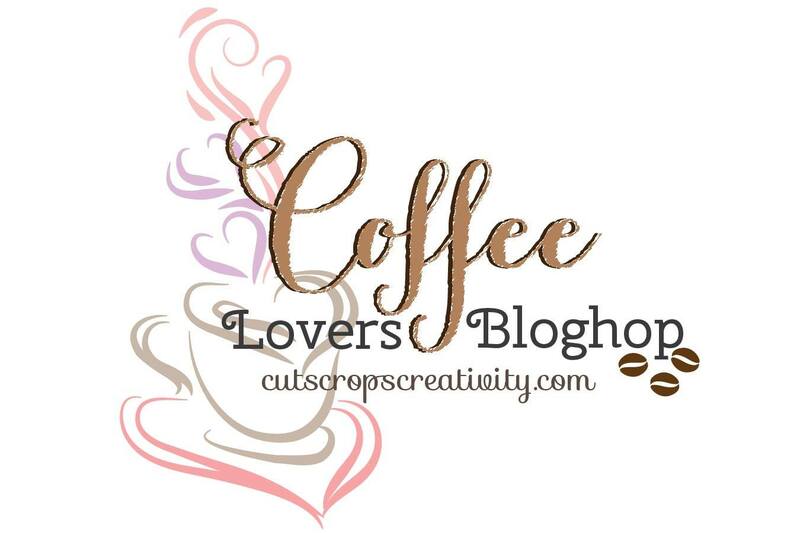 I was so impressed by my friend Tonya's 5 cards for the coffee lover's blog hop, so decided I needed to make another! I used the same Fiskar's Latte Love set and colored it with watercolor pencils and a blender pen. It's hard to tell in the picture, but I added some Wink of Stella to the hearts on the cups. 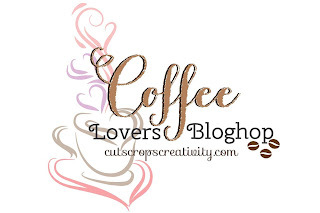 There have been a lot of fun coffee cards in the blog hop - have you added yours? 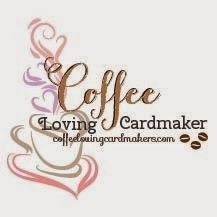 I'm sharing a card I made for the Coffee Blog Hop on National Coffee Day!! I used Stampin Up paper and paper pieced my little latte cup. The perfect sentiment and a perfect way to show some appreciation with a Starbucks gift card! Just popping in today to share a fun fall card I made! This card is copied from the wonderful Jennifer McGuire. 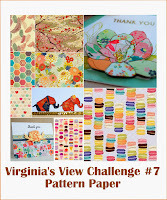 She created this beauty last fall, and when I found these leave stamps at JoAnn's I knew I needed to make a card like hers. Her banner was made from solid cardstock, and I tried that first. But I didn't like how it covered up so much of the pretty leaves. So I decided to go with vellum for the banner instead. My Brother - in - law and his wife just bought a new house, so off course that is a card occasion!! I made this card with the Hero Arts Mia Casa stamp set. I just love the house in that set - the perfect size for a card front. I used SU paper from the calypso coral celebration add on kit. The Home Sweet Home saying was pieced together from an HA Alpha set and a friendship sentiment set. 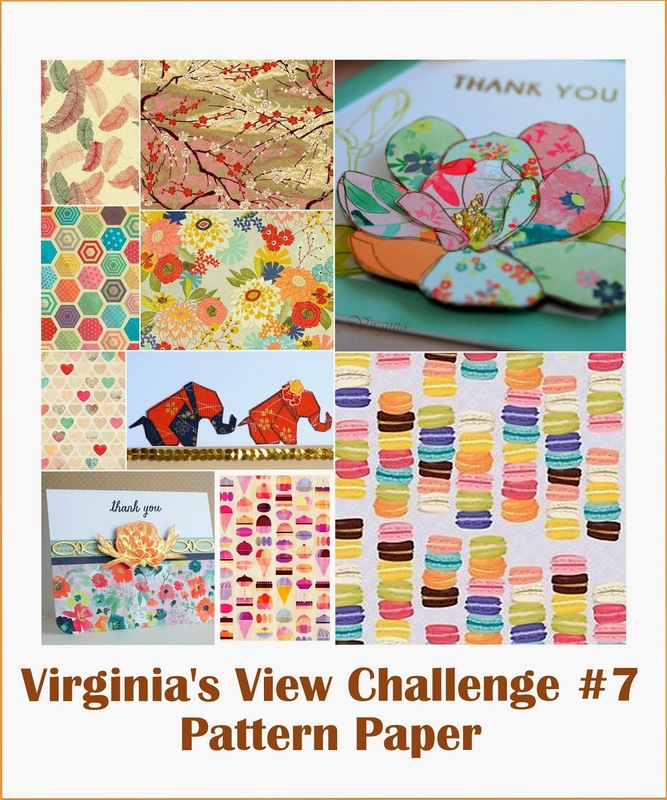 Since this card uses lots of patterned paper, I am submitting it to Virginia's View Challenge. 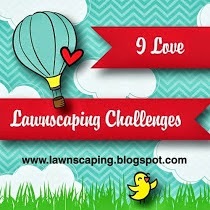 Love that challenge - always lots of inspiration there! 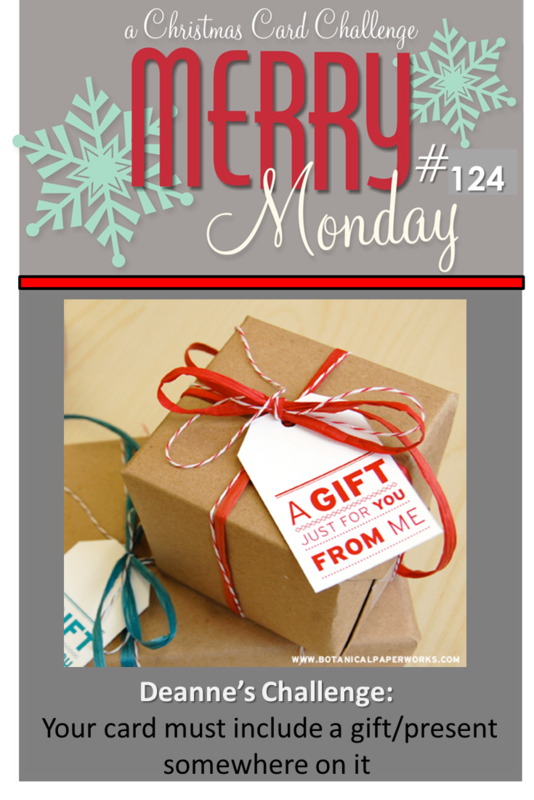 I have a fun Christmas Card to share with you that I created for the Merry Monday Challenge. 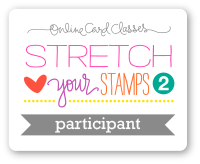 And since it uses a stamp I bought last Christmas, it falls under the NBUS category and I will link it up to Darnell's challenge too. 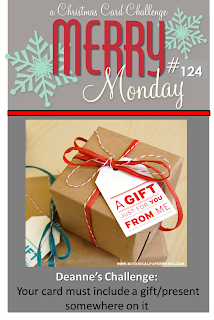 Merry Monday's challenge was to use a present on your card. I used the Memory Box Presents of Joy stamp and then watercolored in my gifts with distress inks Fired Brick & Worn Lipstick and Mowed Lawn & Peeled Paint. I added the polka dots on the green gift with some white pigment ink after the watercoloring had dried. For a little interest, I added some splatter in both red and green. Then I popped up the panel on a green card base. Thanks for looking! Are you glad the kids are back in school? I am a little sad to see summer end, as we had such a great summer this year. But it nice to get back into a routine again!